MEDIA MODIFIER™ POWDER STAIN REMOVER! Just Add Two Scoops Of Powder Directly In Tumbler Or Vibratory Cleaner. Media Modifier™ Stain Remover Has been developed to clean really dirty brass, But more especially brass that has been stained from the use of Black Powder that has not be removed from cases within a reasonable amount of time. Media Modifier™ Stain Remover will take that tired looking antique patina off your cases (Without Harming The Case)to prep your brass for a cleaner brighter looking match grade factory finish Using Media Modifier™ Cleaner And Polish Sold Separate. You will noticed a cleaner primer pocket after using Media Modifier™ .Many Of you Have Very Hard To Get Brass Some Irreplaceable. Now You Have A Way To Recover That Old Stained Case. Use Media Modifier™ Stain Remover in conjunction with walnut media. 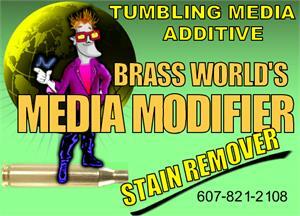 Media Modifier™ Stain Remover also will clean your Tumbler No More ring. And Remember a little goes a long way 2 scoops for 3-5 pounds of vibratory tumbling media. Media Modifier™ Stain Remover is a trademark of Brass World Of Walton N.Y. Keep Out Of reach of children Do Not take Internally-ventilation Recommended May cause Eye And Skin irritation upon Contact.After Handling wash Thoroughly. Keep Out Of reach Of Children.Brass World Can not Be held Responsible For Misuse Of This Product.